Pancreatic Cancer Action are proud to be part of #TheGlovesAreOn campaign! After being diagnosed with breast cancer in October 2017, Soraya Kelly set up #TheGlovesAreOn campaign to raise awareness for the early detection of breast cancer. Soraya has now developed the campaign by uniting charities to join forces in raising awareness for early detection, including Pancreatic Cancer Action. 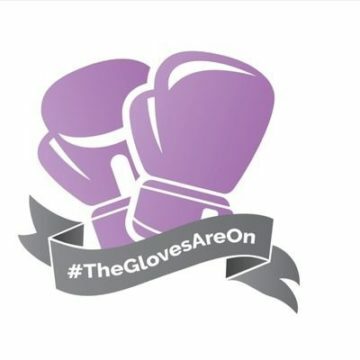 The Soraya Kelly Foundation is a charity that aims to support members of the community, other charities and research organisations through fundraising and the sale of #TheGlovesAreOn merchandise. The charity works with universities, schools and colleges to generate awareness of serious issues affecting both adults and young people. Their approach is to support those who need it most – they have an ‘inclusion for all’ ethos. Soraya’s philosophy is that, with a collective approach, better outcomes will prevail. This is one of the reasons she got in touch with Pancreatic Cancer Action. “As a result of a friend who has sadly passed away quite recently of pancreatic cancer whom was diagnosed around a similar time as my diagnosis of breast cancer, and then finding out that PCA is known as the silent killer, as more often than not the symptoms develop or get missed and it is too late. Soraya will be distributing leaflets in schools which will include information on pancreatic cancer, to help raise awareness across Wales. It’s so important to join together in the journey in the fight against cancer and increase the public’s knowledge on cancer. We are thrilled to be part of this campaign hope that, together, we can make a real difference! To find out more about Soraya’s campaign- click here.